Sean Patrick Kelly is a writer, consultant and publisher who is not funded by Big Oil. Connect with him via FaceBook, LinkedIn, Twitter, his FranBest.com franchise blog, or email (seankelly[at]ideafarm.net). 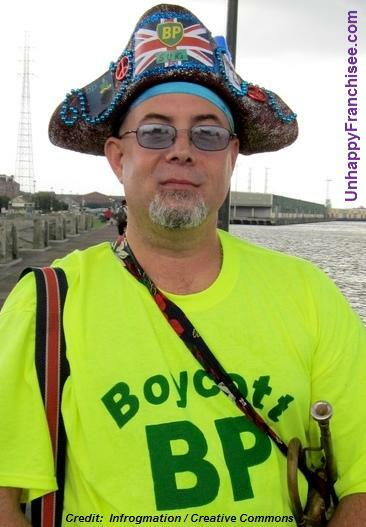 ← BOYCOTT STUPIDITY: Support BP Franchise Owners! You’ve got two number 4’s there. Great article otherwise. Thanks for the catch, Beau B. Avery. I have to say that I disagree with you here. First off, I am on a campaign to reduce my use of fossil fuels in the first place, so I may not be the best person to comment here. I started to write a long response, so decided I would blog about it myself. I will post it at http://www.greatlakesgreenpages.com. This is a great resource and advice that I wish more people would heed. The feeble minded seem to steer the ship with regards to popular opinion in our country. We have nobody to blame but ourselves and our insatiable appetite for oil. As a small business owner, I understand that BP franchisees are the only ones who are going to be hurt by the boycott. Think about it don’t hurt the little guys! – Based on several articles written in June, BP is in no danger of bankruptcy because of the clean-up and boycott, although it is understandable that they would want people to think that. They average 2.5 billion per quarter. People are absolutely right in pointing out the gas itself can come from many sources, and that many, if not all, gas companies come with questions about human rights abuses and enironmental disasters — http://www.newsweek.com/2010/06/07/boycott-bp.html — all this should inform any decision to boycott or not. But can’t we try to move towards weaning ourselves off oil — through lifestyle changes, voting against “Drill, Baby, Drill!” — while at the same time using free market forces (a boycott is the free market at work) to affect a company that is actively responsible for a current environmental disaster in our waters? To me it seems a boycott would be the beginning of more comprehensive, effective change, while choosing not to boycott is MORE likely to lead to an apathetic return to old habits. I would encourage franchise owners affected to petition BP to let them out of their contracts, and, if they don’t, take that story to the media. #1 is a ridiculous reason. Franchisees bought into the BP image when they decided to open a BP franchise as a opposed to one of another oil company. These franchisees reap the benefits of all the national advertising that BP pays for, and for years they reaped the benefits of BP’s “green” advertising campaign. For years they got fat off of BP’s positive image, and now that it turns out their choice of franchise was a bad one, they expect to be rewarded for it? They pay franchise royalties to BP, and any boycott that shuts down a local franchisee – or which compels him or her to switch brands – hurts BP. #2 is true … but its false to argue that since its impossible to ensure one never buys anything made by BP – it does no good to do one’s best to avoid it. #3 is the same argument as #1. #4 is just absurd – it doesn’t even make sense. If I buy my gas at the station across the street from BP that is a franchise of another oil company, I’m not hurting the local economy, I’m still buying the same amount of gas in the same locality! #6 If we couldn’t “really” boycott BP you wouldn’t need to come up with reasons for us to not boycott them. #7 You’ve never even spoken to that guy in your life, I don’t really see how you could possibly know how much thought he’s put into anything or how he feels, and even if you did, I don’t see what makes it relevant. #8 BP’s net assets are close to $100,000,000,000. That should cover it. And even if it isn’t enough to cover it, BP will never actually pay more than that amount anyway, rendering your argument moot. #9 Why would I need to name an oil company I “feel good” about? I thought you were against making decisions based on “feeling” ? There is no oil company that has spilled as much oil into the environment as BP. #10 How is that an argument against boycotting BP? Are you suggesting a company’s safety record at deepwater drilling is irrelevant? If company A can deepwater drill without major accidents and company B cannot – that’s not relevant? #11 – “Let’s demand, let’s demand” isn’t going to change the market. The demand isn’t there and no amount of your feel good rhetoric will change that – the only thing that will is cap and trade.